North America’s First LEGOLAND® Theme Park Turns 20 as LEGOLAND® California Celebrates a Bricktacular Birthday! CARLSBAD, Calif.–(BUSINESS WIRE)–Let the party begin! LEGOLAND® California turns 20 years old today. 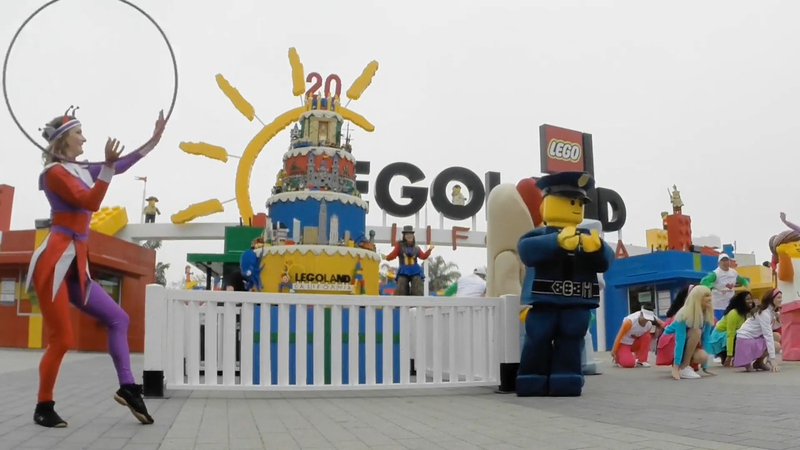 The family theme park in Carlsbad, CA celebrated the historic day with a special Park opening ceremony filled with entertainers, LEGO® characters, stilt walkers, and a one-of-a kind 10-foot LEGO® birthday cake. Since opening its doors in 1999 with 12 rides and Miniland U.S.A., North America’s first LEGOLAND® theme park has grown into a multi-day destination with more than 60 rides, shows and attractions, a 10-acre water park, two-story aquarium and two interactive LEGO® themed hotels. In honor of the special birthday, LEGOLAND California is handing out free child-size Minifigure hands to the first 1,000 kids entering the Park. The LEGO birthday cake, created out of more than 100,000 LEGO bricks, will also be on display showcasing the many attractions that have been added to the family theme park since it opened 20 years ago including a LEGO submarine, representing the Park’s newest ride, LEGO City Deep Sea Adventure submarine ride. The birthday kicks off a year-long celebration that includes a new interactive Birthday Dance Party, LEGO Friends birthday show, exclusive birthday desserts, pop badges and more. The new shows can be seen daily now through Sept. 1 and are filled with singing, dancing and characters for all families to enjoy. Plus, LEGOLAND California is paying the birthday fun forward to its younger guests – all children ages 12 and under get free admission on their birthday all year long! All 20th birthday activities are included with the price of admission into LEGOLAND California Resort. For more information, visit www.LEGOLAND.com or call (760) 918-LEGO (5346).